Oooh, I know I haven’t posted one of these in a while! And it’s not for lack of favorites. I’ve just been having a hard time keeping up with everything, to be honest. A lot of people say to me, “how do you do it all?” Truthfully, I don’t do it all. Not even close. I do what you see, but there’s a lot that slips through the cracks, like these posts! But now that I’m back teaching again, it’s a great time to share some of the things I am loving right now. First a few administrative details! I’ll be at Interabang Books in Dallas on Monday, September 25th at 7:00 pm for a talk, Q&A and book signing. Please come say hi! I’m doing a cooking demo and book signing at Room at the Beach in Malibu on Thursday, September 28th from 1:00 to 4:00 pm. Cooking demo at 2:00, book signing before and after. I’d love to see you! For people who lost power for an extended period of time due to a hurricane, Clean Eating is keeping the cart open for my Batch Cooking 101 Course through Sunday. You can still sign up and we’ll help you get caught up! There are loads of recipes, including a few of mine (like the vegan mac and cheese), which call for soaked raw cashews which then get blended with other ingredients to add a velevty creaminess to the recipe. In fact, cashew cream is even a thing to replace heavy cream or sour cream. There are cashew yogurts and milks on the maket and they’re awesome because cashews are high in protein and good fats, but have almost no flavor. Before I finished the last round of edits on my cookbook, I discovered that I could substitute an equal amount of raw cashew butter (RAW, not roasted) for soaked, raw cashews and the recipe would turn out perfectly. No soaking, no need for a Vitamix or another high-speed blender. Raw cashew butter is a little more expensive than raw cashews, but a Vitamix is even more expensive. I have kept raw cashew butter in the fridge for Mr. Picky’s smoothies, because they add good protein with no flavor. But now I use it to thicken salad dressings, soups, sauces and desserts. 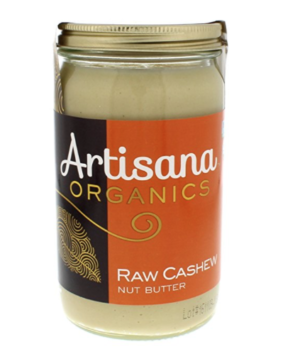 In my classes this month, I am using Artisana raw cashew butter which is available on thrivemarket.com and at Whole Foods, but other brands I have seen are Living Tree Community Foods and East Wind. I also assume you can make your own using this method! During my third pregnancy, I could no longer tolerate strong fragrances. It was so weird. I had to stop using perfume, lotions, going to nail salons or walking past Bath & Body Works at the mall otherwise a headache would take over. The unfortunate part is that more than a decade later and I still have a problem with strong fragrances. But I recently found aromatherapy and it not only doesn’t bother me, but many of the natural scents are quite soothing. 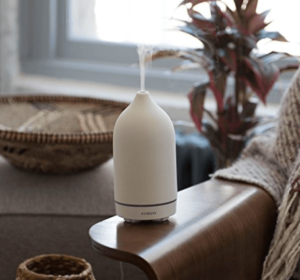 My friend introduced me to a an essential oil diffuser which creates a tranquil fragrant environment in a small room. 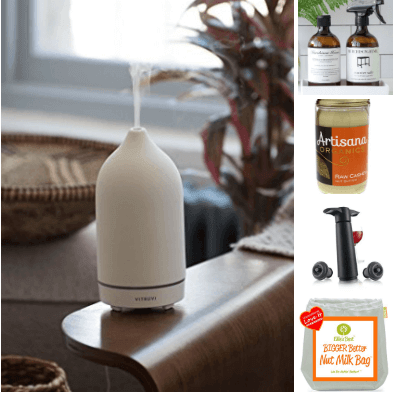 Most diffusers use a small amount of tap or bottled water and a few drops of your an essential oil to create a continuous fragrant mist for hours. I found the Vitruvi stone diffuser and was instantly attracted to its chic, minimalist design and the fact that it’s not plastic. I use a few drops of lavender and turn it on in my bathroom when I start getting ready for bed at night and it instantly calms me down and prepares me for rest. I bought a few other essential oils, which I would consider using at my desk. You have to look into the effects of oils, but some can be used for focus, to be uplifting, to calm and so on. I bought the Vitruvi one from the company’s site and I paid full retail, but amazon has it on sale now. And you can find lots of other diffusers essential oils out there as well. I think this would make a great gift for a new home, apartment or office! 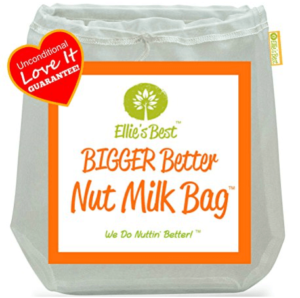 I have two nut milk bags – a small one for making nut milk and a large one (12 x 12) for vegetables. There are certain recipes which require removing excess moisture from vegetables like potatoes, frozen spinach, zucchini, and steamed riced cauliflower, to name a few. I used to use a think flour sack towel, which is great until it rips. Then I got smart and bought a large nut milk bag which is made of nylon and practically indestructible. It is also a breeze to clean – I just rinse it with warm tap water and turn it inside out to dry over the faucet. Pamela 10. You can also find the bag on amazon. I wash A LOT of dishes. A LOT! And it’s not my favorite task, but it’s part of cooking, so I don’t put it off or complain. I was cleaning up after a class at a friend’s house and her dish soap was just about the best smelling soap I had ever encountered. I looked at the ingredients and I was so excited they were non-toxic. Plus the bottle was so pretty and understated. I quickly made a note of it and ordered some when I got home. I have been addicted ever since. What do you do when you don’t finish a bottle of wine? That’s never happened to you? Well, you sound like fun! I, on the other hand, am not a huge wine drinker and use it more for cooking than for drinking. But air oxidizes wine, so once you open that bottle, the lifespan of the wine is short. 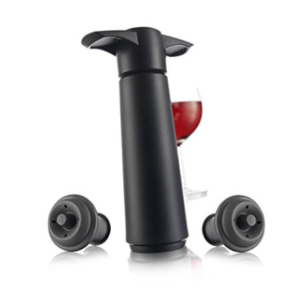 I do not like wasting food or wine, so I found a gadget called a Wine Saver that removes the air from an opened bottle of wine, thereby extending the life of the wine for another week or more. The Vacu Vin Wine Saver extracts the air from an opened wine bottle and re-seals it using a rubber stopper. The vacuum is created by placing a stopper into the neck of the opened bottle and pumping it until you hear a “click”. The “click indicates” when a sufficient airtight environment has been established. Simply pull stopper to break seal and remove, pour the wine when ready to enjoy, reinsert stopper and remove air to seal again. Hand wash the stoppers and they’ll be reusable for years. You can find these at most wine shops or on amazon. Find all my Five Friday Favorites here! Favor to ask: if you haven’t already written a review of my book on amazon, would you please? But only if you love it LOL! Hi Pamela, I have been trying without luck to register for your batch cooking class (last attempted yesterday). I’ve filled out the form that is supposed to direct me to payment, but it only allows me to put my email address in for further notification about the class. And I have received two emails back from them telling me about the course and that they are still putting the finishing touches on not, but no indication of how to pay. I have also emailed customer service, but haven’t received a response and cannot find a number to call. Can you help? I’m so sad it didn’t work out for me to attend your class last week. I really do hope to participate in the online class! And finally, thank you for these 5 favorites! The series is a favorite of mine! Hi Dina! You’re not having success registering because registration is now closed. 🙁 So sad!!! I sent an email to inquire, but we just started Week 3. I love your Friday Faves lists! Thank you so much for sharing! I also only use natural fragrances and can’t tolerate most artificial ones. 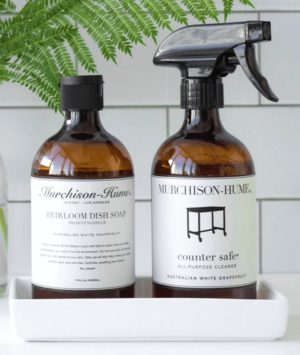 So I’m excited to try Murchison-Hume products. I’m torn between their grapefruit and fig scents, which both sound wonderful. Do you recommend one over the other? Fragrance is so personal! I love all their fragrances, truly. Just this morning I enjoyed the raw cashew butter on toast! I shall look into the other ways you suggested for its use. Regarding the Murchinson-Hume cleaning products code, it expired yesterday , the 21st. Is there anyway this could be extended? Thanks! Thank YOU for the prompt correction! Thank you for the awesome cookbook. A dear friend gifted it to me and I am so enjoying it! The blog is great too. Unfortunately, I can’t get the code to work for Murchinson-Hume. Any tips? Thanks! Hi Lisa, I’m can’t get it to work either. Products are great by the way! Amanda, I contacted the company and they said the code has been used with success. I just tried it myself and it works! You have to use all CAPS and no space between the A and the 2. There are 2 codes within this blogpost. Make sure you are using PAMELA20 and make sure to use it after you have placed items in the cart. Lisa, I contacted the company and they said the code has been used with success. I just tried it myself and it works! You have to use all CAPS and no space between the A and the 2. There are 2 codes within this blogpost. Make sure you are using PAMELA20 and make sure to use it after you have placed items in the cart. So excited that you posted your Friday Faves! Quick question related to your Batch Cooking course which is fantastic by the way! You used canvas bags with a transparent piece to store your veggies instead of plastic which I love. Can you share the brand?